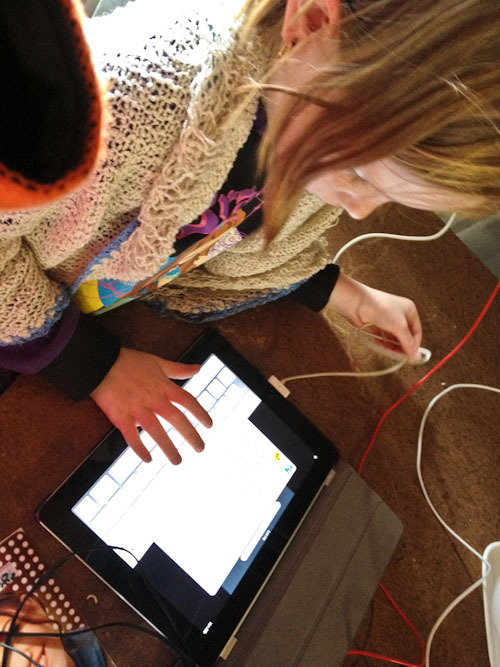 What does unschooling really look like? How does a homeschooling family run smoothly without schedules, learning structures and curriculum? Join our family — for just one day. For the past couple of years, I’ve documented the details of a whole day in the life of our family as part of a homeschooling link-up. A couple years on, I find it fascinating to look back at a typical day at home in our house in 2010 and on the road in New Zealand in 2011 to see how things have changed for us! Although married to David, I am currently a single parent. I have four daughters and unschool quite deliberately. Aisha is 7 and a half. Brioni turned 6 on the weekend. Calista is 4 and a half. Delaney will be 3 at the end of the year. At this time last year, I was six months pregnant with our son Elijah. He drowned in June and my husband is in a mental health facility, charged with Elijah’s murder. My girls and I are living a nomadic lifestyle and are currently fitting out a new bus so we can continue our travels in Australia. We’re living temporarily out of our shed home in Brisbane, Australia. I wake first, finding myself tightly sandwiched between Delaney and Brioni. Aisha and Calista are sharing the double bed below us, and I crawl out quietly to have some time to myself (and online friends) before everyone gets up. By 8.30, everyone has emerged from our little bedroom in our trailer, and I’m serving up breakfast according to requests. Calista wants raisin toast, Brioni asks for porridge and Delaney wants cereal. Later, Brioni decides she doesn’t want her porridge, but Aisha gratefully accepts it. Two of the girls come up and have showers with me. We talk a lot in the bathroom, and after expressing that I was feeling stressed by the things I was thinking about, Brioni simply says: “Well, just stop thinking about it!” She’s right, of course, and I need this gentle reminder to come back to the present moment and appreciate the experiences in front of me. I have chores to do, including washing up and cleaning out the bus. When I start vacuuming, Delaney comes alongside me and asks for a turn. The girls get dressed at their own pace, in between various games — including a vigorous one of jumping off the furniture. We’re all seated in The Gifted Gypsy, and I’m driving us down to a cabinet-maker’s house on the Gold Coast. 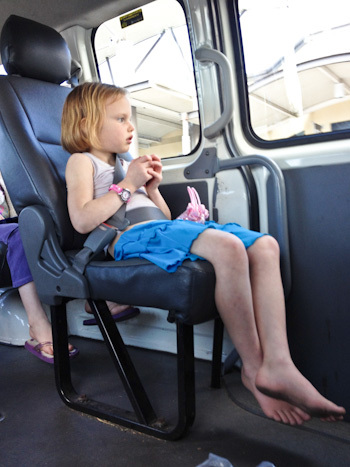 Until the cupboards are built into the bus, we can’t really travel far from Brisbane. For the 45-minute trip, the girls play on their kipis — Aisha is listening to the Chronicles of Narnia’s Boy and His Horse and Brioni and Delaney are sharing a kipi that is showing The Wizard of Oz. KIPIS — A SIDE NOTE: Earlier this year, we invested in two iPads — bought cheaply from Apple’s direct site as refurbished models. Soon after, Brioni coined the name “kipi” for the tablets. After three months with just two kipis, we bought two more so our girls could pursue different interests. We made a deliberate decision to let the girls play with their kipis without restrictions. On their kipis, the girls learn reading and writing, math skills, tech navigation, art and design and science concepts. I’ve deliberately chosen apps and movies that I consider to be have particular value, and whenever I feel like the girls are spending too much time in front of their screens, I am motivated to make real-life more exciting through activities and outings! Calista alternates between watching The Wizard of Oz and playing a robot game. At the cabinet-maker’s house, his wife serves up scones with jam and cream for our girls. They’re happy to sit and continue playing with their kipis while I discuss the details of the joinery with Michael. After our business is completed, Amy drives us to the nearby station so we can catch the train back home. At the train station, a train is waiting for us to board, even though it’s not leaving for fifteen minutes. 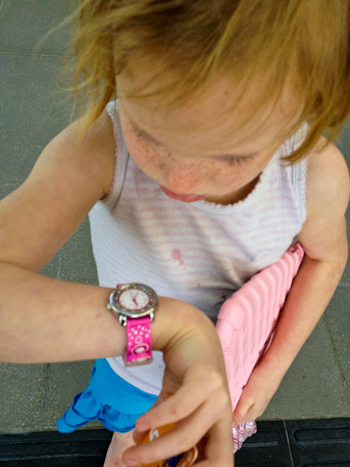 Brioni is intent on reading her new watch throughout the day and happily notifies us of the time approximately every half hour. 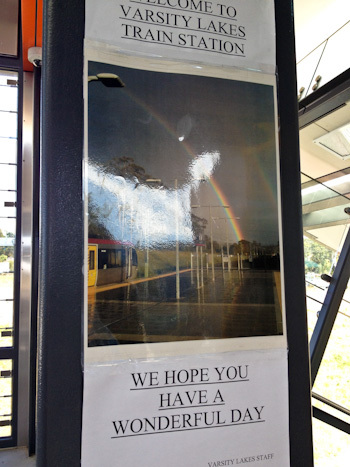 The train station staff have put up this beautiful picture of a double rainbow taken from the train station. Every reference to a rainbow reminds me of my son. We look at a lot of signs and can speculate what the Braille words say because the English equivalent is written above them. 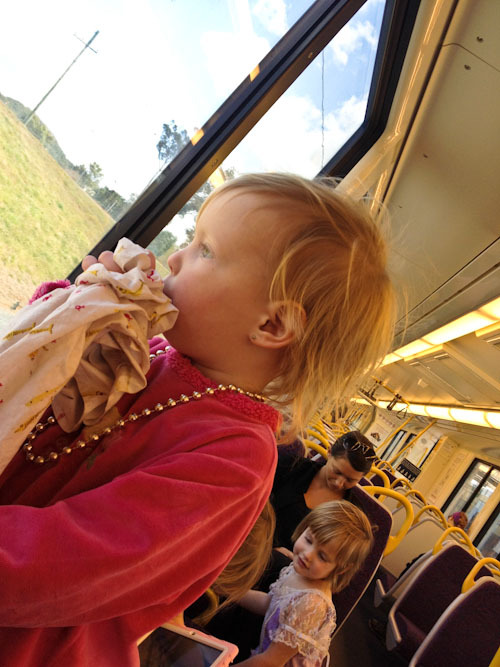 On the train, Aisha continues listening to The Boy and His Horse, and Brioni watches The Wizard of Oz. I keep Calista and Delaney amused by discussing the scenery that flows past our window. 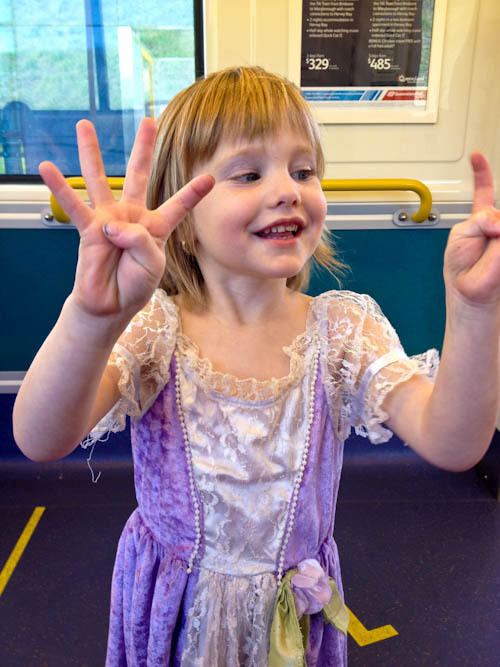 Calista likes to demonstrate random sums on her fingers. When we arrive at our station, we walk the short distance to a shopping centre and start going through the supermarket. Most of our shopping is fruit and vegetables, but the girls have crackers that they like and they ask for some juice as well. Our diet is vegetarian with Brioni a strict vegan, so we shop together for the things we like. 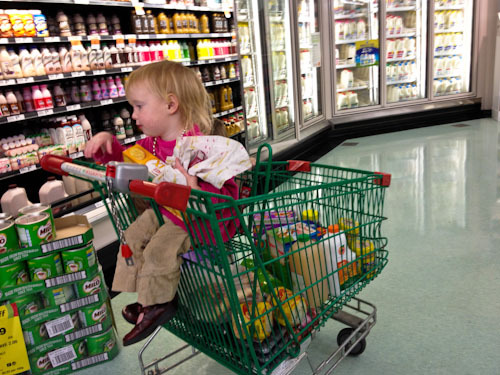 Dell still loves to sit in the trolley but tends to want to hoard her food choices on her lap. Brioni has brought her money along and is looking for opportunities to spend it. However, she doesn’t want to spend it in a boring place like the supermarket — she wants to use a vending machine for the fun of it. Today, we don’t find one for her to use, and I’m relieved because it shortens our time at the shops — I don’t enjoy shopping centres, I find them impersonal and greedy. When we leave the shopping centre, it’s only after visiting one more store. Brioni wants a new cover for her kipi, and we discuss the merits of the covers that are available in the electronics store. None are exactly right, and Bri is happy to wait until she finds one that she really, dearly loves. We have discovered that in modelling wise purchasing decisions and not outright denying our children’s desires, we rarely are forced into a situation where we either have to purchase something we think is poor value or bitterly disappoint our children. We don’t give pocket money to our children, we fill their purses with money whenever they ask. In showing generosity to our children, we give them the freedom to share their purchases with their sisters and others around them without feeling restricted to a budget that may impinge on their natural inclinations to generosity. Today, we use a taxi to get us and our groceries home. Learning the procedure is new for us, and we’re allocated a number of which Brioni takes charge. In the taxi-ride, we discuss the last time we rode in taxis. Brioni’s memory is of this time last year, when I was denied boarding on a plane in New Zealand because I was considered too pregnant and David flew back to Australia by himself with the four girls. This day is certainly memorable for the different modes of transport we have experienced! At home, we snack on our new purchases and I start to catch up on more of the chores. The girls do some drawing, and Brioni starts to construct a ball-run. Aisha calls me over to ask for some spelling help. Aisha has taken to using the search function on her kipi to find whatever she wants to watch/play/listen, and it's naturally improved her spelling and typing skills. 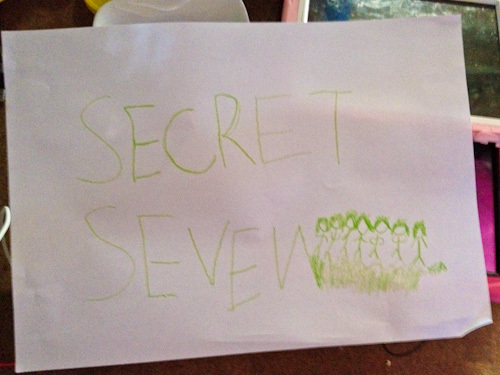 Aisha tells me she has written down "Secret Seven" so she can remember it properly. Later, I tackle more chores and soon find myself distracted by the girls’ games. I jump with Aisha on the trampoline and soon we’re joined by her sisters for a raucous bout of roly-poly. Since David’s departure, I find myself playing the boisterous games of tackle and tickle that use up so much physical energy but replenish my spirit. Brioni creates a picnic dinner for us all. She’s laid out food and drink on an orange blanket and invites us all to join her. She’s carefully thought about everything and has made sure there’s a favourite on offer for everyone. After we eat and drink, the girls split up again. Aisha and Brioni play outside with friends, Calista plays with her kipi again — taking time away from it to show me dancing moves — and Delaney finds toys to play with as her kipi charges. The girls play pirates together in the back yard until it gets dark. When we’re in the shed, the girls have access to a great many toys — Duplo blocks, Lego, Playmobil people and many, many other things. When we’re on the road, we carry very few toys with us. The variety of both these lifestyles teach our girls to be creative when necessary and appreciate toys when they have them. As we wind down for the evening, the girls take turns using the phone to speak to relatives, and I start writing these notes on the computer without connecting online. Delaney helps herself to some blueberries — sharing them with me and her sisters — and later watches part of a Playschool episode on her kipi. 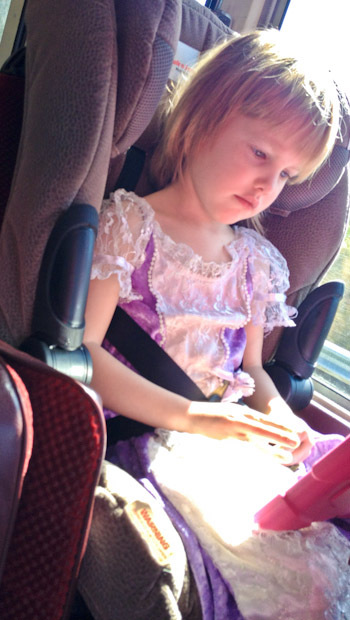 Calista announces she is tired and changes into her pyjamas early before finishing The Wizard of Oz. The girls are all watching movies on their individual kipis — new episodes from Avatar — The Last Airbender. Sometimes they help themselves to a snack — toast, fruit, berries, a drink — and often they serve each other food too. This is the wind-down time before bed, and it’s also my opportunity to get online. The other time that I try to blog is early in the morning before anyone else is up, but I didn’t get that opportunity today. The girls don’t have bed-times. They usually go to bed when I go to bed, or they retire early if they’re tired. Tonight, 2yo Delaney has fallen asleep where she is, and I carry her from the chair into bed. Calista has particularly asked me to sleep with her tonight, so I’ll climb onto the bottom bed between her and Aisha, and Brioni and Delaney will share the top bed. This is it for us today, we haven’t spoken about what we’ll do tomorrow, but there are great possibilities open to us — sparkling adventures waiting to happen. We just need to go out there and find them! Loved reading this; so interesting how it all works out. How cool that each one gets her own kipi! Just wondering what type of pink case Calista has on her iPad? Looking for one for my dd that is sturdy. Thanks! I love your blogs :) I have for a long time. We are unschoolers too and I just love how you do exactly what I do when I feel the kids have had too much screen time, I create something else for them to do. I really enjoyed reading your blog!! Although we are not unschoolers, I really like the way you and your kids school. And I am glad I am not the only one who still sleeps with the kids (especially when Daddy isn’t home). I am praying for you and your family, and I hope you have a great year!!! We’ve gone through a number of different cases for the girls. Calista’s is a Griffin, and I think I’d recommend it over the others. I love to see examples of how unschooling works in real life! We live in a province where they are actively witch-hunting homeschoolers and I have to be able to show exactly what materials I am using for each subject, including publishing date and other nonsense, otherwise we’d lean far more heavily towards unschooling. Hi Lauren, First of all thank you for visiting my blog. I have read your blog for about a month and just want you to know that you are in my thoughts so often. I am sending beautiful thoughts from Alabama. I so enjoyed reading this Day in the Life post. Even though you are going through an unbearable time there is so much beauty in this. I love seeing your girls, learning and playing and laughing together. My boss gave us an iPad for Christmas and it is magnificent. I see it becoming more and more valuable to Keilee. [And I love it too when I can pry it away from her.] I love your Gifted Gyspy. My ‘one day’ dream IS a Gypsy trailer. I even have a Pinterest board dedicated to this. Beautiful girls. You have a beautiful spirit! I very much enjoyed reading your blog this afternoon and soaking in a few golden nuggets. I am sorry for your recent loss. My heart and prayers go out to you. What a fascinating insight into your families’ day! Before I came across your blog, I had never heard of unschooling, and if you’d asked me at the time I’d have assumed it was simply not teaching children. I knew about homeschooling, but unschooling was a new concept. But it is certainly not lack of education – far from it. While I still have a lot to learn about unschooling, I can see how valuable it is, and your children are learning lessons that schools do not teach. I often wonder how much of what I learned in school is being put to good use after I had completed my education. It wasn’t until after I finished school and travelled around Australia and the world, that I realised there’s more to life than classrooms. Life is learning. You can never spend your days doing nothing, you are always learning and growing and taking things in. School to me was often stressful, and you can see with your daughters that learning is fun. You can learn and be happy living your life, they’re not mutually exclusive. Your daughters seem so happy – that’s the thing that strikes me the most. There is an endless supply of love, and strength. You don’t just teach your children, but they teach you. I think we underestimate them a lot of the time. Thank you for sharing – the photos and the way you tell your stories is beautiful, and I hope that you continue to gather strength from the universe, and continue your sparkling adventure. You are beauty and strength, Lauren. and hoping that you have many more amazing, wonderful, sparkling days ahead!! What an interesting day full of adventure! I’m sending you a lot of good vibes and I’ll keep praying for you and your familly, hold on, you are such a wonderful person! Thanks for sharing your daughter’s comment: Just don’t think about it. I have some stresses, minor compared to yours, and really needed to read that. May you be given all the strength you need to care for your precious family and yourself. Unschooling is certainly a great way to do so, although with older kids I can no longer do it that way. I miss it. Praying for many more great days for you and your family. I think this is a fantastic explaination of how this attitude works. We don’t subscribe to pocket money either and your view seems so wise…and sensible! hmmm, I wonder about your choice of the word ‘hoard’. 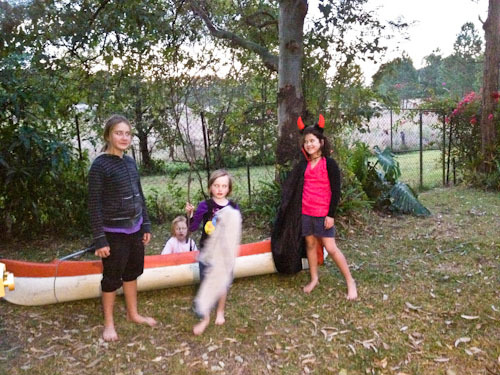 This is an awesome post, a really lovely insight into a unschooling family and your life. thanks for this insight into your life. i’m a newbie unschooler….well i guess not that new, since i believe it starts when a child is born…so almost 6 years! i love finding other families who love to learn this way. i want to write so much to you…how your view on unchurching saved me…how your response to life and difficult times is unmatched in my world. how i wish you could drive up in your gifted gypsie and have tea and conversations one day…does it contain a sail or wings to fly :) …your honesty in blogging and your dedication to documenting your journey is inspiring. peace to you. We are unschooling too. My biggest challenge right now is responding in love when faced with an seemingly endless amount of “wants”. Your description of not out rightly denying their desires, and filling their purses with money makes me want to know more about the practicality of how you are able to do this. I can see, in theory, that this leads to joyful shopping/purchasing, but I don’t know how it is implemented. There are endless Lego sets. There are apps to purchase. There are in-app purchases. How is it possible to give and give and still have money for food? We live on a fixed budget, and while I don’t want to burden my kids with how little money there is to spare on fun things, I don’t know how to navigate the expensive desires without saying no. Would you speak to this? Again, I love your blog. Thank you. Thank you so much! I will think of you with fondness, I feel so inspired.